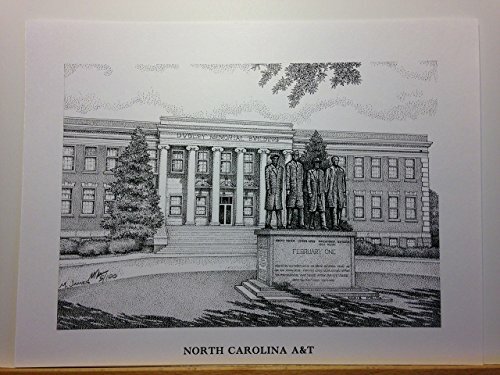 Limited edition pen and ink print from a hand-drawn original of the February One monument in front of the Dudley Administration Building, on the North Carolina A&T State University campus in Greensboro, NC. It represents a seminal moment in the Civil Rights movement when four A&T students staged a 1960 sit-in at a downtown lunch counter in Greensboro. The signed and print is from a series of just 100 prints; and your purchase includes the print, foam-core backing, and about-the-artist flyer within an acid-free packaging.